Steve Mnuchin and Tim Cook at the new campus. U.S. Secretary of the Treasury, Steve Mnuchin, paid a visit to Apple’s new spaceship campus in Cupertino today. 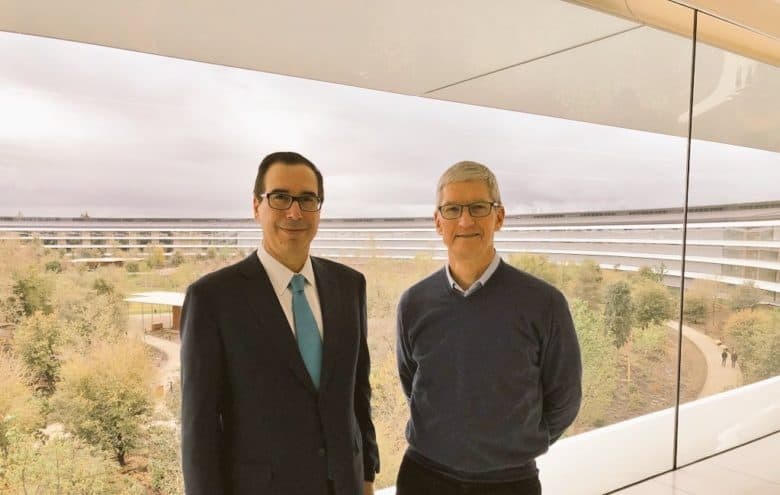 Mnuchin got a tour of Apple Park accompanied by Tim Cook. The Ape CEO has a history of both working against and with Donald Trump’s administration, and in the duo’s photo that was tweeted this afternoon, it doesn’t look like Tim is particularily stoked. Secretary Mnuchin is referring to Apple’s plan to $350 billion into the U.S. economy over the next five years. Apple plans to repatriate its overseas cash in light of the new tax deal created by Mnuchin and the Trump administration. While Apple and Trump have been on the same side when it comes to taxes, the two have clashed numerous times on social issues. Apple wrote a public letter condemning Trumps travel ban in early 2017. Tim Cook has talked to Trump about iPhone manufacturing. Trump called for a boycott on iPhones during his campaign because they’re assembled in China. Apple hasn’t said if Mnuchin and Cook met for anything other than a tour. Tim Cook hasn’t bothered to tweet about the meeting yet either.